Are you looking to buy an Android TV box and don’t know which one to choose? 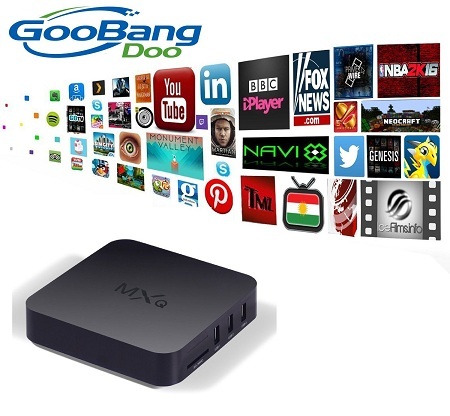 Today I would like to review and recommend you the awesome Goobang Doo MXQ TV box (Amazon link). The Goobang Doo MXQ is a pretty powerful Android TV box, without any doubt. But – you must understand that it’s not nearly as power as more expensive Android TV boxes. Therefore, don’t expect it to run 4K videos or heavy 3D games. 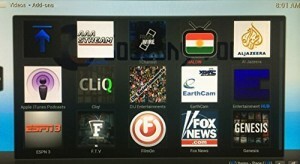 This TV box is perfect for those who look for a reliable, basic and affordable TV box / streamer. Update (11.02.2016) : Goobang released the Gooband Doo MXQ pro version (Amazon link). It now supports 4K video playback and features a 64 bit processor. Performance is improved ! I highly recommend buying the new model instead of the “basic” one. The device comes with many apps like Youtube, Skype, Netflix and Kodi pre-installed. Since it runs the Android opreating system – you can download and install any Android app or game on it yourself. The Goobang Doo MXQ comes with one HDMI cable, a remote controller, a manual, a power cable and a cleaning cloth. The device has a built-in TF card slot, but does not come with a memory card. I highly recommend buying this Sandisk MicroSD from Amazon. Goobang Doo is a well known Android TV box manufacture. I tested and reviewed many of their devices. These guys definitely stand behind their products ! Their TV boxes are resonbly priced. Most of them are sold for very affordable prices. GooBang is a great company that makes great Android TV boxes. They are well known worldwide and their products are used by thousands. I personally really like their Android TV boxes because they are inexpensive and work pretty well. There are so many companies now days that produce Android TV boxes – choosing a reliable one is very important. When we decided to post a GooBang Doo MXQ review – we were sure this device won’t be too powerful since it’s too cheap. But – i must say i personally was really surprised. The GooBang Doo MXQ is not the most powerful device i ever came across – but it’s good enough for most people. It will run pretty much any app or game from the Play Store (including not too heavy 3G games. It works perfectly , and it can smoothly play Full HD videos. If you have a good enough TV – the quality will really surprise you. Why buy an expensive Smart TV when you can buy a device like GooBang Doo MXQ. Many people today don’t waste their money on expensive Smart TV. Why would they, when they can buy an Android TV box for cheap and save a lot of money. I recommend buying GooBang’s i8 wireless keyboard – it works really well and will really upgrade the expirience. Typing with it is so much easier and faster- it’s amazing. The keyboard itself is not expensive. We hope you will find this GooBang Doo MXQ review useful. If you have any questions about the device or Android TV boxes in general – comment below.